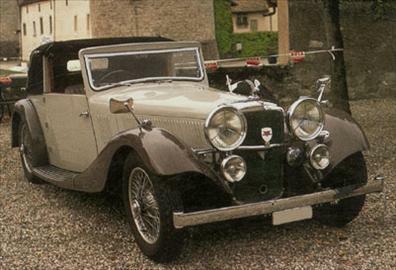 The alvis speed 20, a fast, good-looking and smooth-running touring car, was the cheapest car of its kind on the market. And in 1934 it became the first british car with an all-synchromesh transmission and independent front suspension by a single-transverse leaf spring. Big six-cylinder engine designed and built in only three months by george thomas smith-clarke, alviss chief engineer and works manager, the speed 20 was given the six-cylinder engine of the earlier alvis silver eagle, made more powerful with larger ports and a higher compression ratio. When the suspension and transmission were improved, the frame was stiffened by the introduction of a central cruciform crossmember..these change made the lowslung chassis heavier, so a longer-bore version of the engine was adopted in 1935 to raise power output. handsome bodies the roomy speed 20 bodies were made by outside coachbuilders. A few two-passenger cars were produced, but the rest were four-seat sedans, drophead coupes (convertibles) and sports sedans and tourers, with either two or four doors. A few speed 20s were built on an extended 132-in. Wheelbase instead of the normal 124 in. Ideal for fast long-distance motoring, the comfortable, stylish alvis speed 20 was britains cheapest touring car. Shown here is a drophead coupe.